I tried out this chocolate peda from Mahima's blog. It came out well and all of us loved the taste. Thanks dear, for giving such a easy and wonderful recipe. Please, go here for Mahima's recipe. Great dessert, love Peda, never tried with Chocolate. Lovely recipe and wonderful click..
yummy and delicious pedas...nice topping too! Chocolate peda looks yummy and tempting. 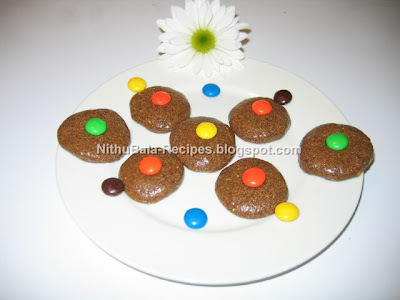 Hey Nithu, Thanks for this nice recipe. Yummy....!!! But I have never ever tried this recipe with drinking choc/ ovaltine. Thanks to Mahima. Lovely Peads..Me too..never tried this with choclate...On my way to Mahima's! Its very sweet of you to share this with us Nithu! Woow Nithu!!.. looks so tempting:).. I love chocolates!!.. yummmmm :):).. with gems!! Lovely sweet and nice colorful click..
love chocolates so so much..urs looks super yummy! Cute and lovely pedas...Looks perfect and tempting.. Anything with chocolate and I'm all game...pedas's look cute and delicious! chocolate pedas look attractive, my kids will adore it!! I have made doodh peda, but never tried the choco version... they look cute and adorable!!! Looks pretty,i have tried milk pedas,chocolate pedas should be double dhamaka! Wow... they looks cute and very yummy. i love pedha! first time hearing of chocolate pedha..Must be really delicious! got to try this! chocolate peda looks really good. I will try some time. oh just now seeeing this. thanks for trying and letting me know dear.